Flashback Friday: Is sewing lost art? Back in the day one of the courses required of every female student was home economics. I don’t remember learning any economics, but I do recall sewing a housecoat (we called them dusters back then). It was so misshapen, the right arm hole was down around my hip. I realized then that sewing was not to be my strong suit. I think that incident marked me for life and I never wore anything homemade again. I’m wondering if home economics is still taught in the schools? June 13th is Sewing Machine Day! No records indicate why Sewing Machine Day is held on June 13th. 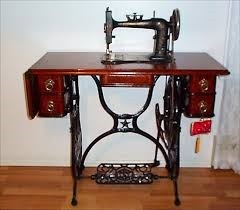 According to the English Patent Office, on July 17, 1790, Thomas Saint patented the first sewing machine. The sewing machine is one of the most widely recognized symbols of the Industrial Revolution and the movement towards production using machines instead of human labor. 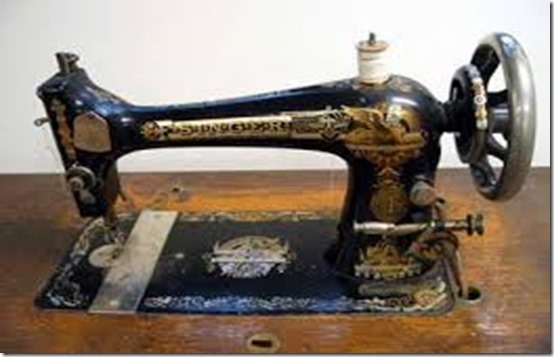 In 1842, John Greenough patented the first sewing machine in the United States. In 1846, Elias Howe was awarded the first United States patent for a sewing machine using a lockstitch design. Although sewing machines are not considered to be a household necessity anymore, they are an important technological innovation that come people still have stashed away in a closet. Today is National Sewing Machine day.and I fondly recall the days when my grandmother made everything from tea towels to draperies. Universities are training fewer teachers or cutting those family and consumer sciences programs altogether so along with cooking and other domestic arts, I fear sewing for the family is practically a lost art. Such good memories! I used to love to sew. I wish I had more time now. Of course it would be on Friday the 13th! !